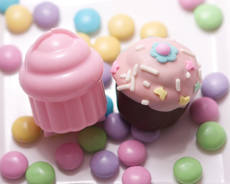 My Little Cupcake’s cupcake molds make mini cupcakes on a stick. They’re irresistible. Six lucky winners will each receive a set of four My Little Cupcake molds—guaranteed to become the most popular molds in the house. For a kids’ project, there’s a no-bake cupcake recipe (simply make a dough from cream cheese and ground chocolate sandwich cookies—it’s delish) and push the dough into the mold. There are other recipes as well. Once popped out of the mold, a lollipop stick can be added (we dipped pretzel sticks in chocolate) and the cupcakes can be decorated with sprinkles, mini chips, etc. The little cupcakes make charming ice cream toppers. We decorated a whole layer cake with mini cupcakes. Learn more at MyLittleCupcakePop.com. mini cupcakes the right. Photo courtesy My Little Cupcake. To Enter This Gourmet Giveaway: Go to the box at the bottom of our Gourmet Cake, Cupcakes & Cake Mix Page and click to enter your email address for the prize drawing. Approximate Retail Value Of Each Prize: $24.00. This contest closes on Monday, January 17th at noon, Eastern Time. Good luck!